July 4th at dusk. Rain date is July 5th at dusk. The Falmouth Fireworks Display will be held on July 4, 2017 (Tuesday) beginning at dusk off of Falmouth Heights Beach and lasts about ½ hour. The rain date is July 5, 2017 (Wednesday). Voted one of the 10 best fireworks displays in the country by Travel and Leisure Magazine! Held each year at the Falmouth Heights beach, this is a classic Cape Cod summer event. As in years past, traffic will be restricted from entering the Falmouth Heights area at 6:30 pm. The restriction will stay in effect until the spectators safely leave the area. 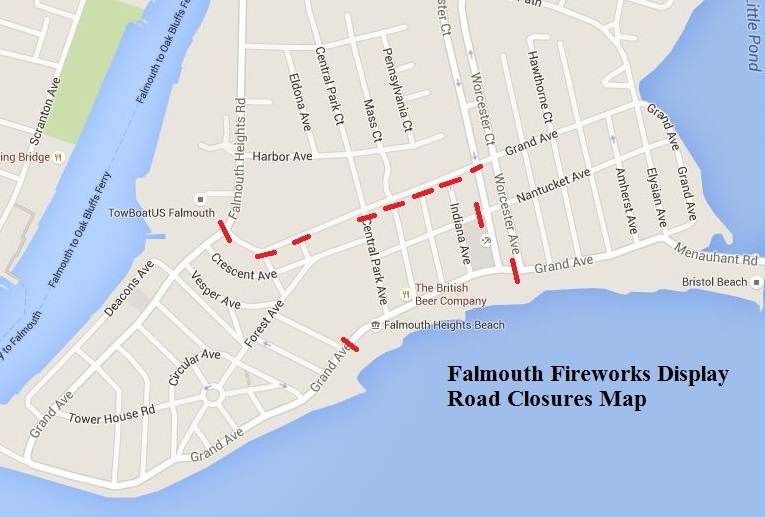 In an attempt to alleviate traffic congestion as a result of the heavy volume created by the annual Fireworks Display, the Falmouth Police Department has devised a traffic plan for vehicles exiting the Falmouth Heights area. Please refer to our Traffic Route Map. All motorists are advised to plan their route in advance. In the interest of public safety, all containers (bags, coolers, etc.) will be subject to random search.